This Pub was originally known as “The Carpenters Arms” which closed down in the early 1830’s. 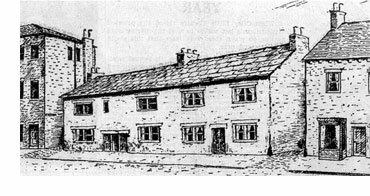 Its licence was then renewed under the name of the “Wharfedale Inn” and had a new Landlord, Jonathan Bailey in 1849. Samuel Wilkinson was Landlord in 1902 who stayed there until 1907 when the licence was refused and closed on the 21st December 1907. It was thought to be 400 years old in 1934 when demolition started, along with two adjacent cottages, a former foundry and other property to make way for the new road “Crossgate” and new bus station. In October 1934, workmen erected a palisading around the Inn and from inside the building came the hollow thump of hammers on old walls. The demolition had begun. The building was so old that no-one appeared to know how far its history went back. The owner, Mr. Tom Smith of Otley, guessed its age to be at least 400 years old. Whilst the inn was being demolished, a sixpence and a penny piece were found in the walls. Both coins bore the head of George III. The sixpence was dated 1816 and the penny 1866. The site is now part of the bottom end of Crossgate.